and ace your permit test with ease! Do you want to be able to brag to your friends about how easy your learner's permit test was? With our Drivers Ed app for iOS and Andriod devices, you can do just that. The Drivers Ed app is a study companion unlike any other on the market. It includes all of the vital information that you'll need to pass your state's permit test, which makes it the perfect choice regardless of where you live! Your completed tests are saved so you can monitor your progress as you learn. Questions are randomized to ensure you always see new material. And best of all, the Drivers Ed app allows you to ask as many questions as you want. Great news for California, Texas, and Colorado residents. You can officially take your drivers ed course through our Drivers Ed app! No more class trips or boring lectures. Use our app for a complete training experience. Whether it's earning your drivers license, clearing a ticket, or lowering insurance rates, our easy to use Drivers Ed app can help you pass your driving test with ease. 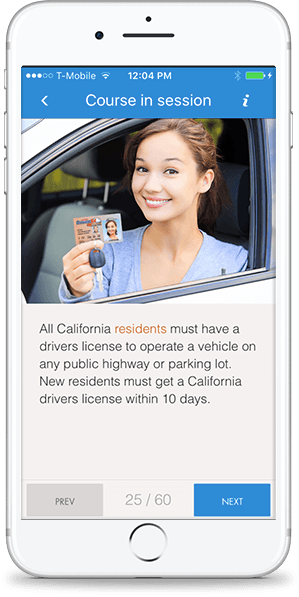 Download it today and start driving in no time!